Posted in Salads, Veggies/sides, on April 19th, 2010. This is a kind of a salad. Well, or a side dish. What do you call a pasta dish that’s served at room temperature? In any case, this was a very easy one to make and had lovely fragrances (saffron and basil). I think the clipping I have is from an ancient Gourmet article, but I’m not sure. I’ve changed it some anyway. Not a lot, but a little. And the best part is that you can make this ahead. We were entertaining the night before Easter, and I needed to take a carb for Easter dinner too. So I made a big portion and divided it in half. Just remember to add the garnishes (almonds, green onions and basil) just before serving. I had some extra fresh squeeze orange juice, so I drizzled that into the salad just before serving. NOTES: If you squeeze extra orange juice, save it until just before serving and drizzle it over the pasta. It gives it a new little jolt of flavor. And if you make this as a part of a large dinner, it will serve more than 4 people. 1. In a saucepan, boil the orzo in 6 cups boiling water with the saffron for 8 minutes, or until the pasta is al dente. Drain it and rinse under cold water. 2. In a bowl stir together the zest, orange juice and salt to taste, adding the oil in a stream, whisking, and whisk until it is emulsified. 3. 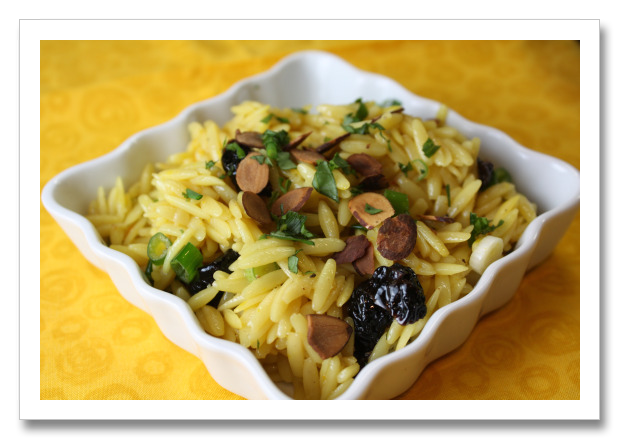 In a bowl toss the orzo (drained well), with the dressing, the cherries and half of the green onions. Just before serving garnish with almonds and the extra scallion. Serve the orzo at room temperature. Per Serving: 320 Calories; 13g Fat (37.1% calories from fat); 7g Protein; 44g Carbohydrate; 2g Dietary Fiber; 0mg Cholesterol; 7mg Sodium. Just took this salad for picnic at outdoor concert at Deer Valley….22 hungry palates all agree this salad is a keeper!! Easy to make, can deal with 100++ temps, and made for even better leftovers the next day!! Will make it again- and again!